U.S Citizenship Interview - Documents to bring? Hello. Does my petitioner need to be present at the interview? My Lawyer will be present. Do I need to bring the original I-94? All my expired and a current valid Passport? 245i Labor Certification (ETA 750) from on or before 4/30/01? My last 5 years of tax return as well as W-2s? What about other tax forms like 1099s? Social Security statements? I registered on Selective Service System as an undocumented Overstayed Visa between ages 18-25. Would that be a problem? ... did you look at the link? Technically you don't have a petitioner. You petitioned the N400 yourself. Even if you're doing ROC you are your own petitioner for it. Good luck with your interview. I hope you learned the 100 questions so you can pass the test. I am not eligible to apply till 2023. Still got time to prepare LOL. My concern is that my brother helped me register for SSS on paper as far as I know in 1997 and I was an undocumented overstayed Visa with my own SSN. 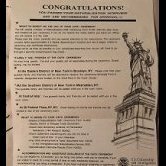 I know that undocumented alien men between the ages of 18-25 have to register but at that time in 1997 did the form ask for immigration status? For example: I am a U.S Citizen? Lawful Permanent Resident? etc. Have you asked your lawyer? Not yet but I will. Do you have any advice? Not yet but I will. Do you want any advice? Might be nice for other people going through the process. Sorry. I meant do you have any advice for me? If you are a lawful permanent resident, you must submit photocopies (front and back) of your Form I-551, Permanent Resident Card. You will also need to bring your Permanent Resident Card and a state-issued identification such as a driver’s license to your interview with USCIS. If you have lost your Permanent Resident Card, attach a copy of any other entry document or a photocopy of a receipt showing that you have filed the Form I-90, Application to Replace Permanent Resident Card. I am a fan of front loading. What about the other things I mentioned? Good grief. Some people have more time on their hands than others apparently.